Detail of the goddesses Eris and Themis from a painting depicting the judgement of Paris. 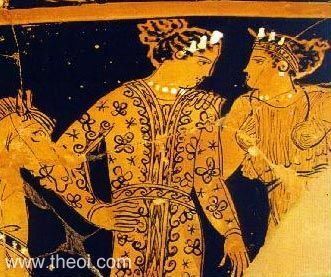 The pair observe as the goddesses Aphrodite, Hera and Athena compete for the golden apple of discord which Eris had earlier cast amongst them at the wedding of Peleus and Thetis. In the Cypria epic Themis, councillor of Zeus, helped initiate the complex series of events which led to the Trojan War.